Boeing's Delta 4-Heavy rocket will stand 235 feet tall and generate two million pounds of Earth-shaking thrust at blastoff. 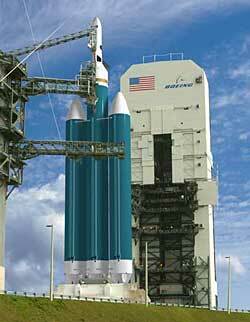 Its maiden launch is anticipated to occur on July 3 from Florida's East Coast. Inside Launch Complex 37's Horizontal Integration Facility -- a white, 7-story building with floors said to be the most level in the U.S. -- workers have been busily assembling the booster stages comprising the Delta 4-Heavy. Last week, the final stage was attached using a laser-guided precision alignment system. Over the past 12 months, three Delta 4 rockets have reached space, all flying the Medium configuration with two stages. The lower stage, called the Common Booster Core, features the 650,000-pound thrust Rocketdyne RS-68 main engine; the upper stage, with the payload mounted on top, sports the cryogenic Pratt & Whitney RL10 powerplant. The Delta 4-Heavy is, in effect, a giant brother of the Medium, providing a major increase in the amount of cargo it can carry. 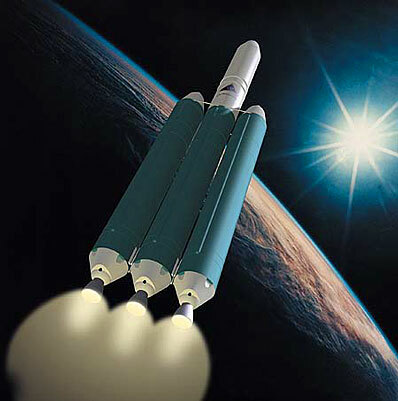 The Heavy is created by taking three Common Booster Cores -- the hydrogen-fueled motor that forms the Medium's first stage -- and strapping them together to form a triple-body rocket, and then adding the powerful upper stage. The result is a launcher capable of delivering 29,000 pounds of cargo into geosynchronous transfer orbit and 50,000 pounds into low-Earth orbit. Around December 10, the Delta 4-Heavy, minus its payload and nose cone, will be rolled from the hangar to pad 37B where a hydraulic lifting platform will stand the rocket upright. The vehicle will remain on the pad for seven months, undergoing a methodical plan of critical tests, fueling exercises and countdown simulations to prepare for the inaugural launch next summer. "When we first get out there, we are going to hook up the umbilicals, do some integrated testing between ground system and the vehicle. We go through a series of electrical tests...as well as tuning the environmental control system. Once we are done with those, we will move into our tanking tests," Dan Collins, Boeing's Delta program manager, explained in an interview this week. 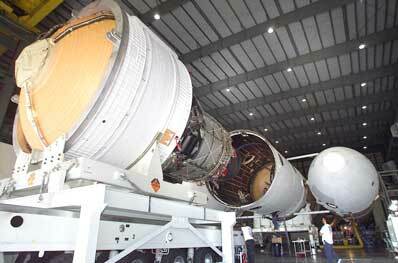 Crews will commence the fueling tests by loading only super-cold liquid oxygen into the rocket. A subsequent test will see only liquid hydrogen pumped into the vehicle. Later, a dual tanking will be accomplished as the rocket stages are filled with both oxygen and hydrogen. "Once we have done that and learned the lessons, then we will move into a Wet Dress Rehearsal where we will perform exactly as a day of launch, to a timeline, and count down to T-0," Collins said. 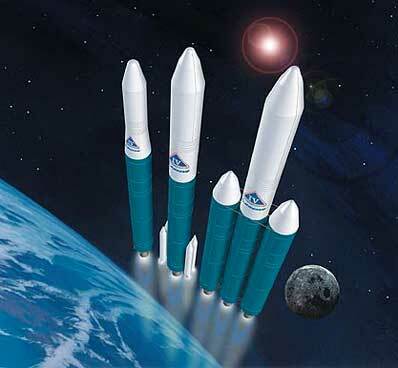 In all, the rocket is expected to undergo at least four fueling events prior to launch. "It is giving the launch team the experience and giving the entire team the data," Collins said, explaining the reasons for doing the tests. "We have a lot of good analytical tools that have predicted how the vehicle will react as we tank three of these CBCs at one time, and this also will be the first time we have tanked a five-meter upper stage. We will learn a lot about our thermal environments from these tests and validate our analytical models and make any adjustments as necessary so that we can make sure we have the vehicle properly conditioned when we get down to the launch window to make sure everything is within the proper range, temperature-wise. That is one of the big lessons or pieces of data that we will pick up," Collins said. "We have launched three Delta 4's. There has been some variation in each of those vehicles as we have tanked them. They have been pretty similar but in a different portion of the acceptable range. One of the real challenges of the Heavy is that we expect the same minor variances from each CBC of the Heavy as we really saw in the first three missions. But now we have to deal with them at one time. So that certainly makes it a little more complicated." As the rocket is filled with the cryogenic propellants -- chilled to several hundred degrees below zero Fahrenheit -- the space hardware will be affected by the temperature change. With the three Common Booster Cores strapped together, engineers want to gather information on how the Heavy responds in the real-life conditions at the launch pad during the fueling tests next year. "There are aspects of this that we have to respect," Collins said. "When you are loading all three of these CBCs at one time, we have allowed for differential shrinkage of the different CBCs. But we have to monitor that closely." Given the previous experience of flying the smaller Delta 4-Medium boosters, is operating the Heavy like dealing with an entirely different launcher? "Rather than being a completely different rocket, in some respects it is like trying to launch three of them at one time. So that is where the challenge comes in," Collins said. The most recent Delta 4 mission, performed this past August, successfully placed the Air Force's Defense Satellite Communications System B6 spacecraft into the correct orbit. Since then, Boeing officials and engineers alike have been focused on the Heavy demonstration flight, which is the next Delta 4 rocket slated to fly. "After the DSCS B6 launch, we sat and looked very hard at the lessons we had learned from the first three (Delta 4 flights) -- where things that we had done very well and were very proud of, such as three-for-three successful missions, but also where we felt there was room for improvement. We sat down and took those into account and put together a very good plan, I think, for moving to the Heavy launch," Collins said. "At this point, we are right on that plan, very happy with the progress we've made with the data we have gathered and the team is executing very well. We still have our challenges ahead of us but we think we have the right plan, the right group of people and the right amount of contingency to let us handle the unexpected that may arise." Collins added that a review of the Delta 4-Heavy vehicle is currently underway between Boeing, the Air Force and the National Reconnaissance Office -- the U.S. government agency responsible for designing and operating the nation's fleet of spy satellites and an upcoming user of the Heavy. "We are going through a two-week, in-depth technical review of the Heavy design with the Air Force, NRO, as well as a group of consultants that we have brought in from Boeing to make sure that, technically, we are in good shape. And that review is going very well." The initial launch of the Heavy rocket will carry only a simulated satellite payload. The U.S. Air Force funded the qualification flight to prove the rocket works before costly, vital national security spacecraft are put atop the vehicle. 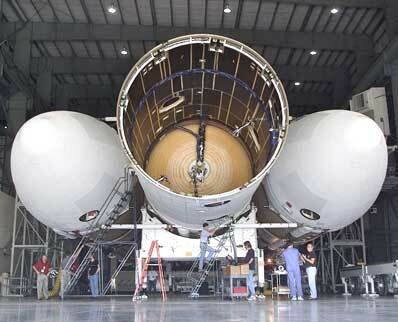 What's more, the Heavy is vying to launch NASA's proposed Orbital Space Plane. The OSP would be the next-generation human spacecraft to replace the space shuttle for ferrying astronauts to and from the International Space Station. "First and foremost is place the payload into its proper orbit," Collins said of the test flight's goals. "And I think demonstrating the vehicle capabilities and providing the data that will help us further the cause of mission assurance on future flights are really the key objectives here." A missile-warning satellite and a classified NRO payload will be the first operational cargos flown on later Heavy rockets starting in 2005 from Cape Canaveral. What will the Heavy's liftoff be like? "It will be another majestic launch," Collins said, noting that the rocket will ascend slowly and very loudly from the pad. Preview what a Boeing Delta 4-Heavy rocket launch will be like with this animation package showing a vehicle lofting two communications satellites into geosynchronous transfer orbit. (1min 41sec file).